March is flying by, it’s already the twenty-eight day of our National Craft Month celebration! It’s time to once again share a new and exciting giveaway and craft tutorial with you! Remember, you can visit our blog every day to enter to win a different prize of the day, but hurry up, there are only 3 chances left to win! Find the contest rules and enter below. Since it’s day 28 of National Craft Month, our friend Amy Anderson has decided to share her Colorful Button Collage tutorial with you. This project is a great one to make with little ones that love to get crafty! They also make wonderful decorative pieces for kids’ bedrooms. Decorate your little one’s room with a Colorful Button Collage, they’ll love to have something they helped make in their room! Try making one of these cute collages with the kids. This Colorful Button Collage is a great way to spend some creative time with the family. Plus it’s a simple and inexpensive way to make some home decor! What is your favorite scarf style to knit or what other crafts do you make? 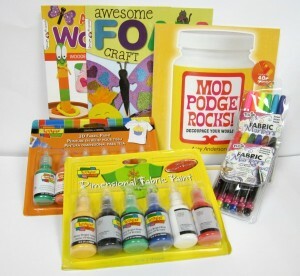 You must “like” the AllFreeKidsCrafts Facebook page to be eligible. You have until tonight, March 28th, 2013 at 11:59p EST to leave your comment on this post. Comments posted after that will not be counted. Don’t miss your chance to stock up your craft stash and win a $1000 Michael’s gift card. You can enter each day to win this amazing $1000 Shopping Spree at Michaels. You have 3 more days to enjoy National Craft Month, so take some time out of your day to come to the FaveCrafts blog each day to hear about the latest prize.